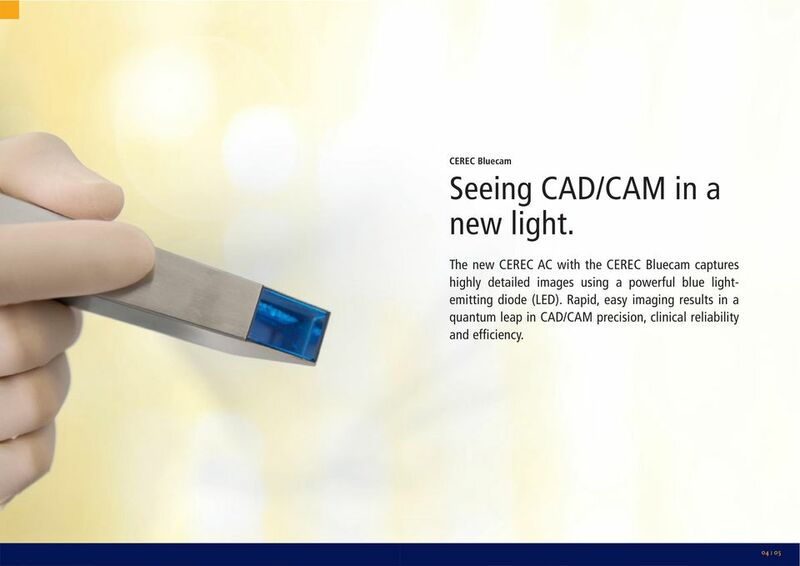 Seeing CAD/CAM in a new light. 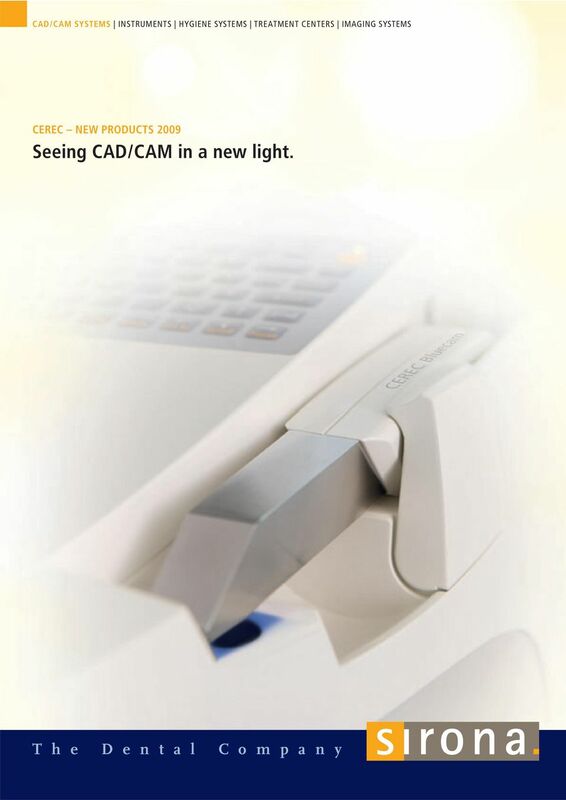 Download "Seeing CAD/CAM in a new light." A complete system geared to your success. Your stepping stones to success. 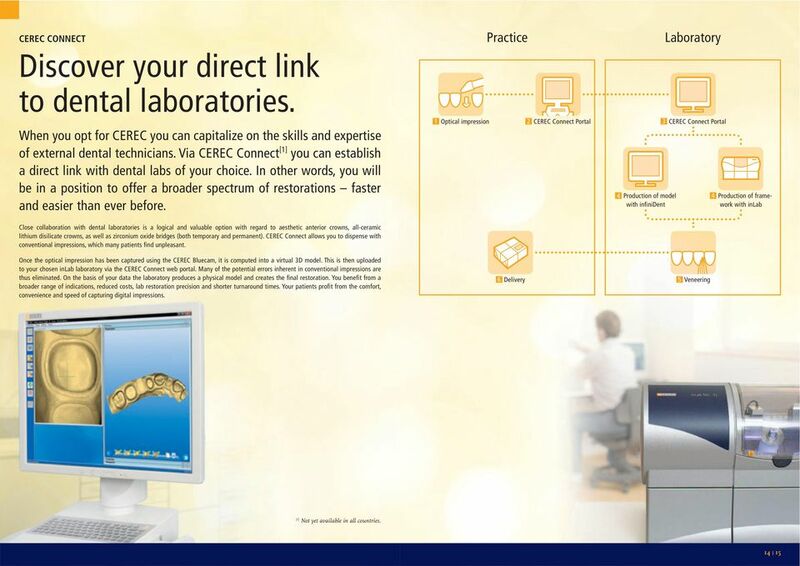 CEREC MUCH MORE THAN RESTORATIONS. 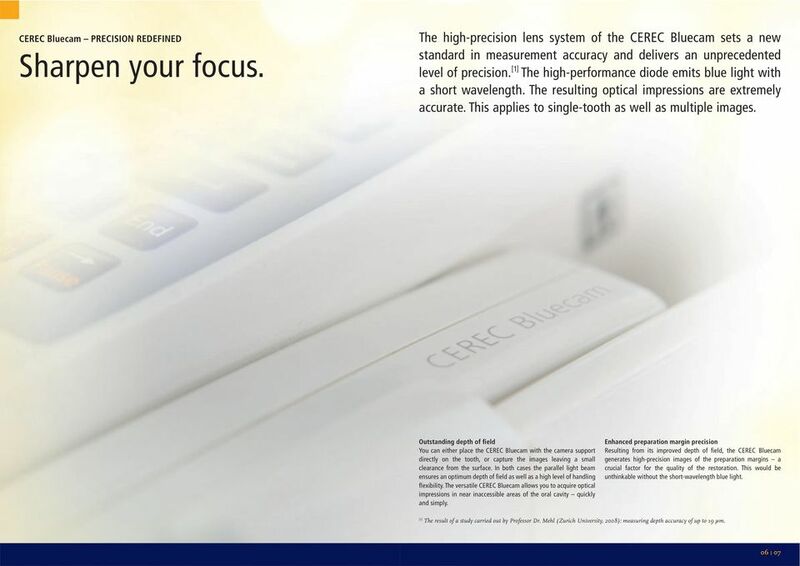 C A D / C AM SYSTEMS INSTRUMENT S HYGIENE SYSTEMS TRE ATMENT CENTERS IM AGING SYSTEMS XIOS PLUS the intraoral sensor system Systematic X-ray diagnostics as flexible and individual as your dental practice. 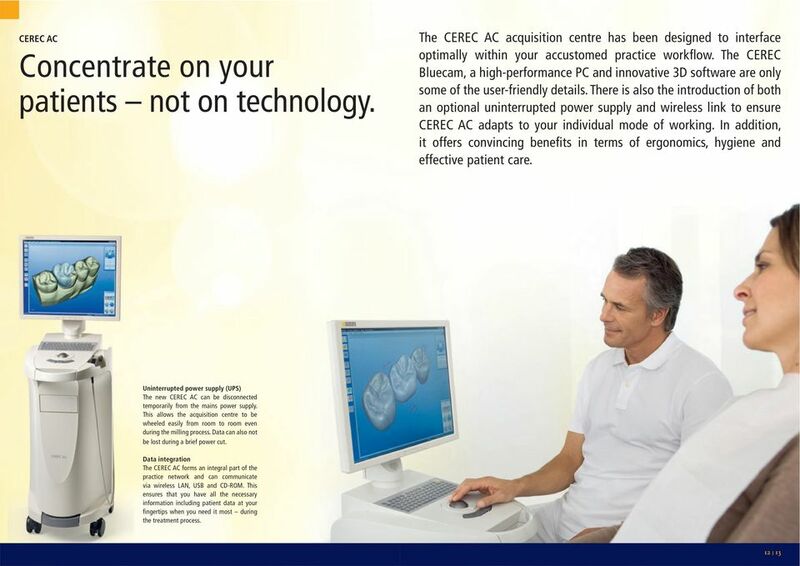 Systematic X-ray diagnostics as flexible and individual as your dental practice. 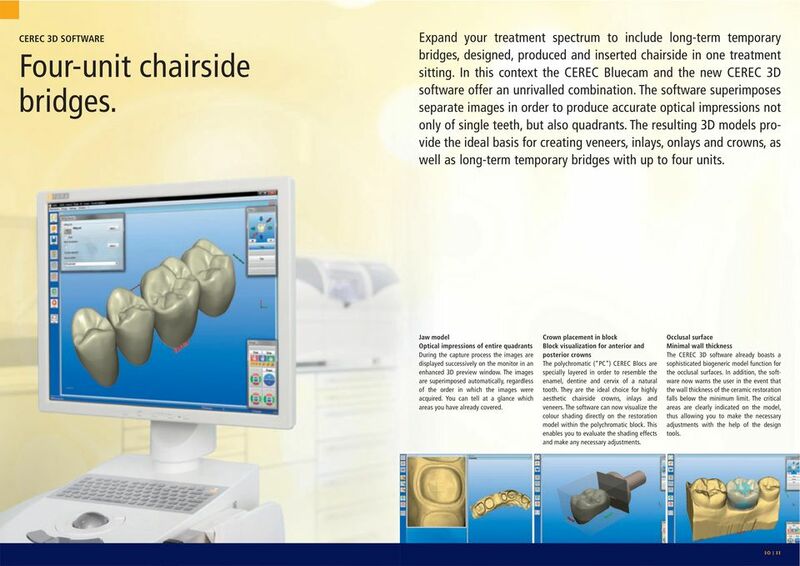 CEREC inlab the multifunctional CAD/CAM system for modern dental restorations. Totally lightweight, totally flexible, totally titanium. Design ideas for dental practices. With Sirona. C4 + Compact design newly defined. T1 LINE. Handpieces. T1 LINE supreme ergonomics in titanium. Abutment Solutions For customized implant restorations fabricated with CEREC and inlab. Digital all around. Just one click gives you more class. Handpieces. T1 CLASSIC ergonomic perfection in titanium. The professional for your diagnostics. We make a point of ensuring safety. CAD/CAM MATERIAL. ALL FROM ONE SOURCE. Curing Lights HALOGEN CURING LIGHTS 5.2 L.E.D. CURING LIGHTS 5.3 LIGHT GUIDES 5.5 RADIOMETERS 5.6 ACCESSORIES FOR CURING LIGHTS 5. ORTHOPHOS XG 3 instruments treatment centers Imaging systems cad/cam systems ORTHOPHOS XG 3 Digital panoramic X-ray for practical diagnostics System concept Standard panoramic X-ray with proven technology. Intraoral Cameras. 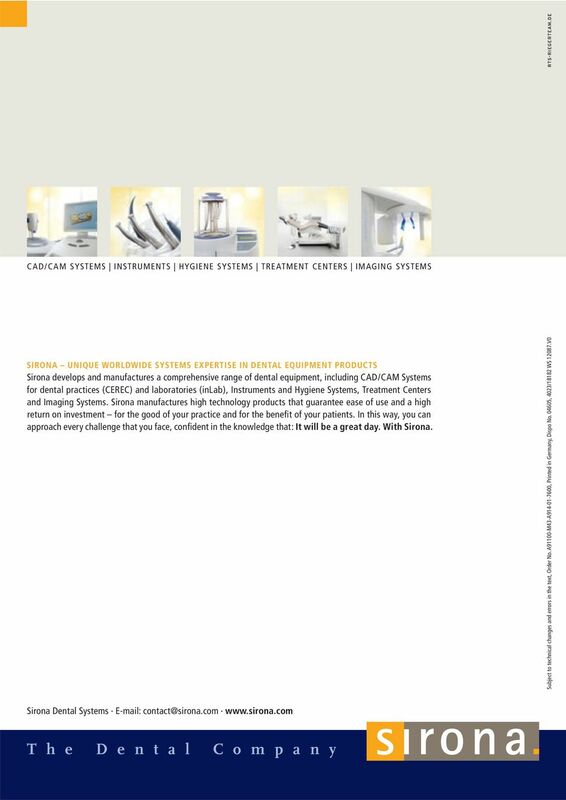 Intraoral Cameras from Carestream Dental. A tradition of superior quality and ease of use for better patient care. Products & Services Catalog 800-437-3261 313-383-0111 www.artisticdentallab.net is the Ideal Posterior Replacement BruxZir Solid Zirconia is a monolithic zirconia for crowns, bridges, inlays, or onlays. ALWAYS AT THE FOREFRONT OF INNOVATION! Crown and Bridge Lecture 1 Dr.Nibras AL-Kuraine Jacket crown It is a type of crown that is formed by a tooth colored material. It is mainly used as a single unit in the anterior quadrant of the mouth. Basic information on the. Straumann Variobase Abutment. Basic information on the Straumann Variobase Abutment. 1 Straumann is the industrial partner of the ITI (International Team for Implantology) in the areas of research, development, and education. Contents. RVG 6500. Innovation set free. Simpl Implant Abutments with Atlantis CAD CAM Technology Don t change your implant... change your abutment. 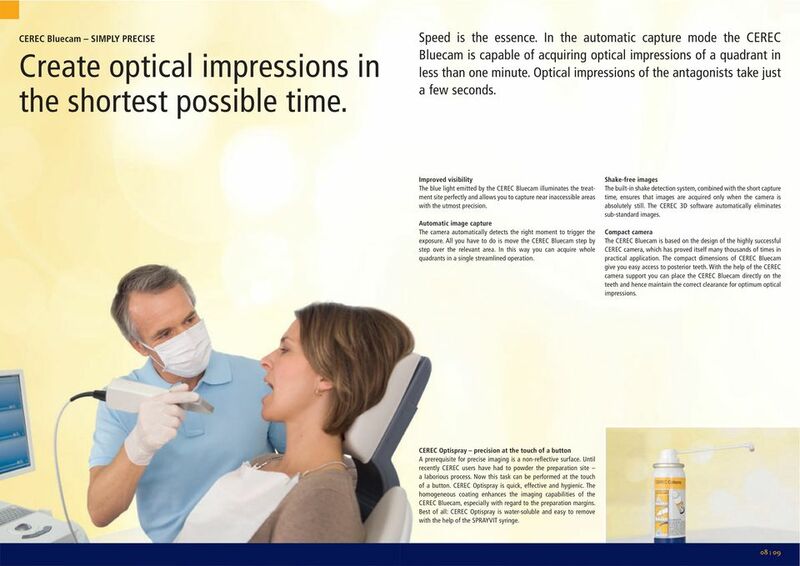 See more patients in less time... and save money in the process! See how we ve made it Simpl. 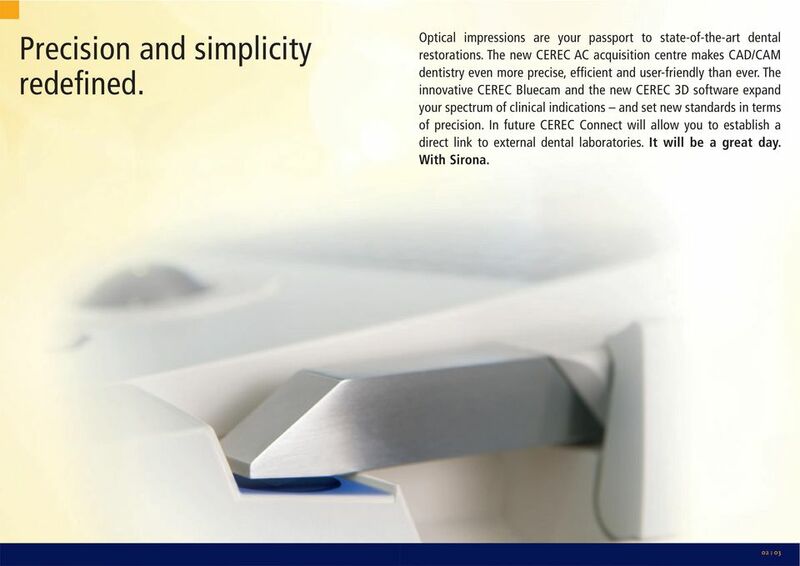 World leading in innovative restorative and esthetic dental solutions. INTEGO. PERFORMANCE YOU CAN RELY ON. Top quality geared to challenging applications. How can I manage all automation software tasks in one engineering environment? siemens.com/comos-pcs7 Integrated engineering with COMOS and SIMATIC PCS 7 Added value throughout the entire plant lifecycle: Maximum data consistency from planning through automation up to operation.